We’re excited to announce that MBD has been shortlisted for an award celebrating the best innovations in Leicestershire. We have been shortlisted as a finalist for the Innovation in the Creative Sector Awards at the Leicestershire Live Innovation Awards, due to be held in April. 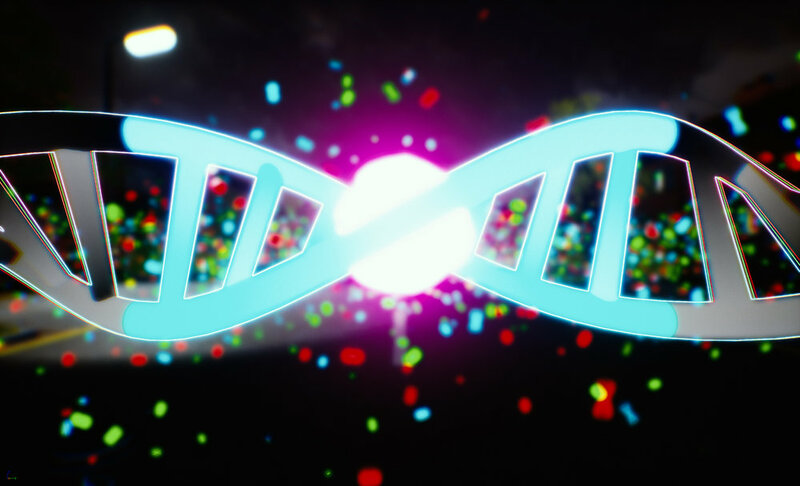 The Awards will celebrate the very best technology, services, digital advances, and creative thinking that Leicester, Leicestershire and Rutland have to offer. 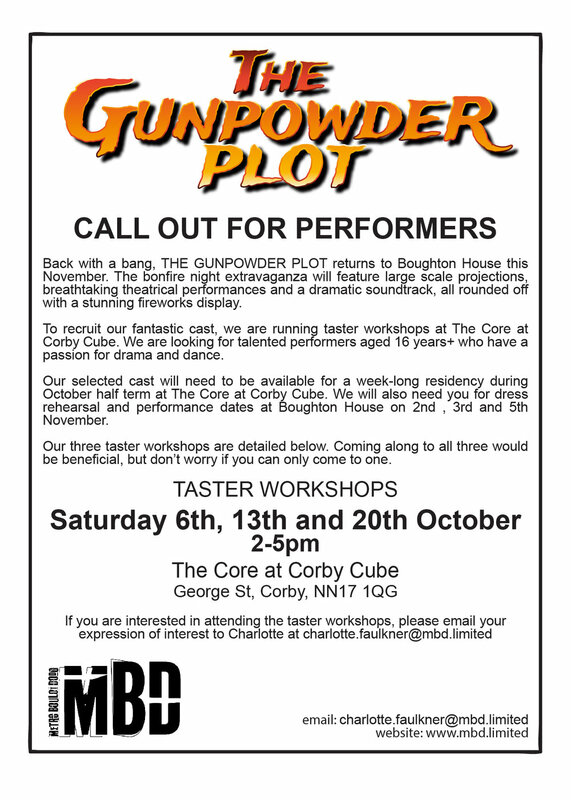 We are looking for talented performers to join our production of The Gunpowder Plot at Boughton House in Kettering this November 2018. We hope you can join us at our TASTER WORKSHOPS at The Core at Corby Cube in October. Exciting news; Empire Soldiers VR is in the running for a prestigious digital art award. 60 artists from around the world have qualified for this year's Longlist including MBD. Empire Soldiers VR has been selected in the AR/VR category. The winners of the prize will be selected by an industry panel however there is also a people's choice award. If you have seen or heard about Empire Soldiers VR and liked it, please vote for us. Voting closes on 31st August 2018. Finalists will be announced on September 1. Winners will be revealed on September 27th at the Frontline Club in London and live on Facebook. Wish us luck! We're looking for actors for our latest VR film Empire Soldiers - A South Asian Story. The film tells the story of the treatment of South Asian soldiers in World War One. It explores their journey from the trenches to a new home in the UK and the impact that this has had on the world we live in today. This is the second film in our Empire Soldiers series following the award winning; Empire Soldiers - A Caribbean Story. Male Actor/Voiceover artist - The artist will be the voice a young Indian soldier in WW1. The successful performer must be able to speak with a South Asian accent. This job will require one day of audio recording work at our Leicester studio. Female actor/performer for 360 degree filming - The performer will be playing a young woman in modern day Britain. The performance will be filmed in against a green screen. The performance will be filmed standing and seated and will be mostly spoken word to camera. The successful performer must be able to speak in a modern day British accent. This job will require one day of filming at a location yet to be confirmed. Filming and Recording for both parts will take place in mid June 2018. Would you like to receive MBD news straight to your inbox? Here at MBD Towers we have been working on a shiny new newsletter. We plan to send it out every 3 months or so. It will keep subscribers up to date with all our projects and events and any other interesting stuff we can think of. We did it! 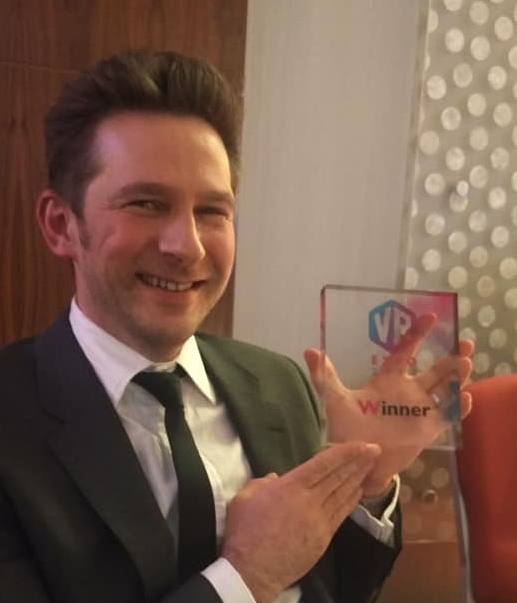 We have won a VR Expo award for Empire Soldiers VR. The awards ceremony was held in Nottingham and it was a fantastic black tie affair. Our Artistic Director Paul scrubbed up well. We were nervous and excited to be there, then thrilled to come away as the winner of the Immersive Theatre Award. We want to say a big Thank you to everyone who helped make Empire Soldiers VR happen. Big Thanks go to funder Arts Council England and commissioning partner Threshold Studios for believing in the project, without you guys it would still just be an idea. Massive thanks go out to Karl Arthur for his fantastic research, writing and creative contribution. Without Karl's passion and research we would never have started on our Empire Soldiers journey. Also shout-outs to Alphonso Christie, Mellow Baku and Sally Hossack for being part of the bigger team, you guys are great! The whole MBD team is on cloud nine and loving seeing our shiny new award in the office! So what's next? The team is now working on the second VR film in the Empire Soldiers series telling the stories of the South Asian Soldiers in WW1 and their families. Keep your eyes peeled for more information on the next instalment. It's been a busy couple of weeks for the Empire Soldiers project. We have had two meetings of our fantastic volunteer group who have starting uncovering some of the stories of the South Asian Troops in WW1. On Wednesday last week we hosted a fascinating talk by academic and author Dr Santanu Das. Then, on Friday we interviewed a lady whose Grandfather had served in the 32nd Lancers in the Great War. This project is uncovering a wealth of incredible stories already. This Thursday, 1st March, we will be hosting our second talk of the project. Leicester-born historian Gurinder Singh Mann from the Sikh Museum Initiative will be giving a free one hour talk about the experience of Sikh Soldiers in the Great War. This talk will have a particular focus on how the soldiers were recruited, and what happened to them when the war ended. Newarke Houses Museum, The Newarke, Leicester LE2 7BY. It will last approximately one hour and will be followed by a Q&A with Gurinder Singh Mann. We will be holding some more free public events as part of this project soon. Keep an eye on our news pages, facebook and twitter for more updates. This project has been made possible by the support of the National Lottery Players and the Heritage Lottery Fund. Dr Santanu Das is an academic and author, best known for his work on the literature of the First World War. As part of the 'Empire Soldiers - A South Asian Story' project, Dr Das will be giving a free one hour talk about the experience of South Asian Soldiers in the Great War. Phoenix Square, 4 Midland Street, Leicester, LE1 1TG. It will last approximately one hour. The event is free to attend but places are limited. Tickets can be booked via Eventbrite. Image supplied courtesy of the Wellcome Collection. We've got amazing news to share; we have been nominated for 3 VR expo awards for Empire Soldiers VR. The winners will be announced at the Awards ceremony on 9 March 2018. We have been having a fantastic time over the last few weeks working with The Open Theatre Company and Birmingham Hippodrome to create an exciting new theatre production of the classic fairytale; Hansel and Gretel. Premiering in April, the show is a mixture of live music and hilarious performance, all set against a mesmerising fairytale backdrop. The show supports emerging performers with learning disabilities, some of whom appear in the production. Ever wanted to be part of an MBD project? Here's how you can…. We are looking for volunteers and interviewees to be part of our latest Empire Soldiers project. Empire Soldiers - A South Asian Story will tell the stories of the Indian Soldiers who fought in WW1, their move to the UK, and the stories of their families in the 100 years since. 2018 is the centenary of the end of World War One and is the perfect time to share these amazing stories with a wide audience. This incredible history will then be turned into a Virtual Reality film by our artistic team. The film will be shown at a celebratory screening in Leicester in the summer and then toured across the UK in late 2018. We are really keen to uncover stories from people of South Asian Heritage who may have ancestors who fought in world war one. Alternatively if you have an interesting story about how your family's move to the UK we would love to hear it. We will be recording the interviews, and some of the audio may be used in the final VR film. If you have a story to tell, get in touch! MBD is keen to uncover stories from people of South Asian Heritage in Leicester who may have ancestors who fought in world war one. MBD is also looking for volunteers to form a Leicester based research group. Over a four week period, volunteers will attend workshops and research trips about South Asian soldiers who fought in World War One. Volunteers will also receive free training in the arts of interviewing and learn the technical skills to record high quality audio to be used in the VR film. If you’re passionate about heritage or have a story to share we would love to meet you. Drop in to the Lightbox at LCB Depot, 31 Rutland Street, Leicester, between 3pm -5pm to chat to us about the project and find out more. There will also be a chance to watch our first VR film in this series: Empire Soldiers- A Caribbean Story. 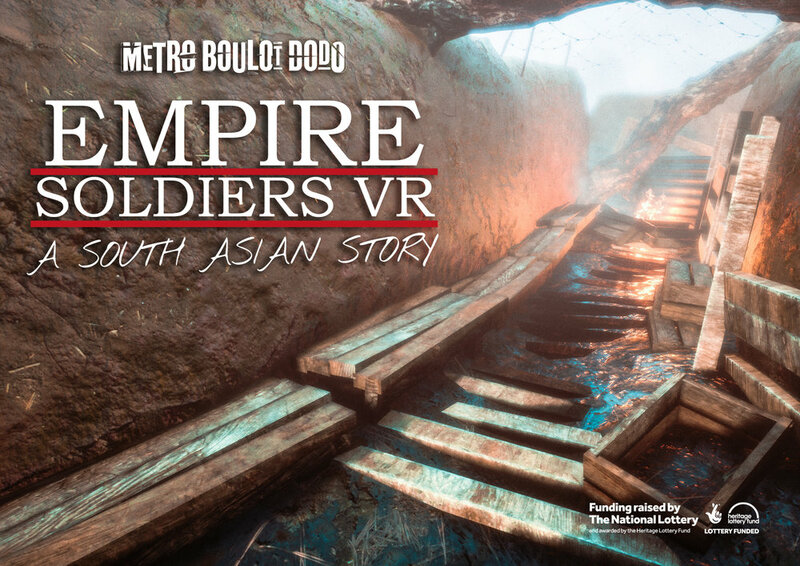 We are thrilled to announce that we have received Heritage Lottery Funding for an exciting new research and VR project: Empire Soldiers - A South Asian Story. 2018 is the centenary of the end of World War One and is the perfect time to share these amazing stories with a wide audience. Many of the soldiers who fought for Britain in the war came from overseas, including India, and moved to the UK at the end of the war. To commemorate the role of these soldiers, we will work with community volunteers to research the stories of these soldiers and their families. We will then turn this incredible history into the second Virtual Reality film in the Empire Soldiers series. We are keen to uncover stories from people of South Asian Heritage in Leicester who may have ancestors who fought in World War One. If you have a story to tell, we would love to hear from you. We are also looking for volunteers to form a research group. Volunteers will attend workshops and research trips about Indian soldiers who fought in World War One. If you’re passionate about heritage or have a story to share, please contact us! We really hope that you can join us on this exciting new journey and support us along the way! Obviously the first mention on any web site needs to be the "we've got a new web site" post. So here it is. Let's not labour over it too much, but all the same we are rather pleased and we hope you find lots of interesting stuff to read and see. Oh, and Merry Christmas..... Which means it is the end of the year, and that means only one thing. 2017 marked the 20th anniversary of MBD and what a year it has been! It’s been an incredible 12 months for the team with good news galore. The team has doubled in size from 3 members to 6 with the additions of Charlotte, Andy and Ant. This has boosted the creative team with the addition of in-house animation and VR skills and made for a much noisier office. It’s been super busy with a wide variety of projects. Particular highlights have been a fascinating oral archiving project with Liverpool’s Metropolitan Cathedral, a large outdoor spectacle celebrating Stamford’s historic bull run, and a breathtaking performance of the Ramayana at Leicester’s Diwali celebrations. Another highlight was the premiere of our first VR film and performance installation; Empire Soldiers VR in October. 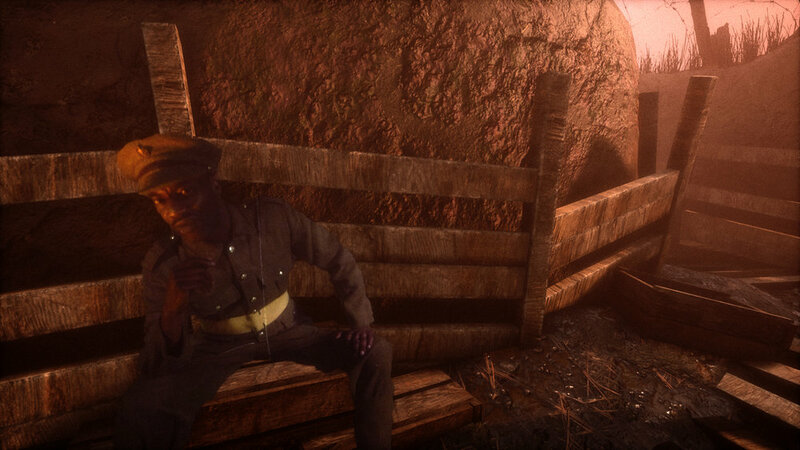 Commissioned by Threshold Studios and supported by Arts Council England, Empire Soldiers VR told the story of the Caribbean soldiers of WW1 and was shown at 3 festivals over nine days. The emotive and innovative show will tour across the UK in 2018. In addition to this we survived an exhausting 25 pitches over 2 days at DOCFest’s Alternate Realities market, joined Canvas Arts as a network partner and successfully won the opportunity to create an exciting new VR project as part of Creative XR. Winter VR will be a new fully immersive VR interpretation of 2006’s Winter, part of the 4 seasons project. The big success story of the year was getting the amazing news that from April 2018 we will become part of Arts Council England’s National Portfolio. Thank you to everyone who’s been part of our journey over the last year, and the 19 years before, we couldn’t have done it without you. We’re wishing you all a very merry Christmas and a wonderful New Year. So, goodbye to 2017 – you’ve been incredible, and hello to 2018 – bring it on!